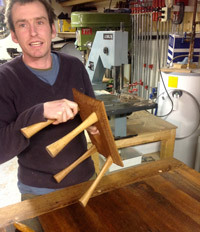 Oliver Drake grew up in Hudson, Quebec and has been woodworking professionally since 2000. He discovered furniture making accidentally, after heeding his father's advice about needing a trade "when the revolution comes". (He's still waiting). For 3 years in British Columbia and a year in the French Pyrenees he devoted himself to the craft of fine woodworking and in 2004 moved to the UK, setting up shop as Drake Wood Design in Bristol. His experience working with British craftsmen inspired an interest in antique restoration, timber framing and the refashioning of reclaimed timber. He took part in Cheltenham's prestigious Celebration of Craftsmanship and Design for 3 consecutive years and has been involved in projects of varying scale — private residences, commercial venues and public spaces. Actively searching out and using ethically sourced timber is integral to Oliver's work. If possible he uses 'good wood', whether it's hemlock joists from an old flour mill or a local walnut tree that's come down in a storm. He occasionally incorporates unusual materials like metal, glass, old tools, hardware and the wonderful porcelain tiles made by his partner Kate Douglas in his pieces. A power tool enthusiast? Yes, but he insists that the best part is working with hand tools. Every job is the result of a process of collaboration between Oliver and his clients. His normal procedure is to consult, sketch, do detailed renderings, present a quote and start on client approval. He would be happy to discuss any project you might have in mind. Lead time depends on the scale of the project and how busy it is in the shop!